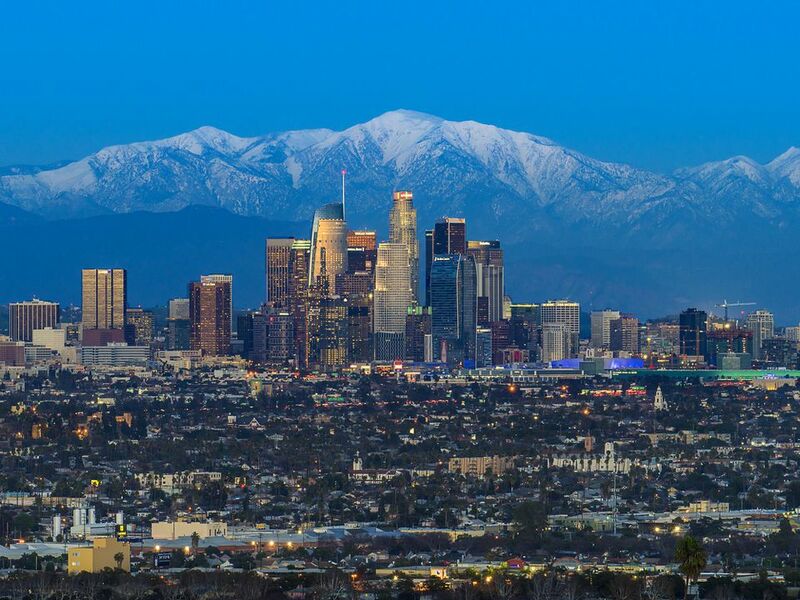 November is a great month for a quick escape to Los Angeles before holiday madness begins. You can enjoy a zany parade, check out the latest automotive trends, go to a top-notch film festival, or just enjoy early winter's smaller crowds and generally pleasant weather. You'll have about 10 hours of daylight per day to explore Los Angeles in November. Thanksgiving is celebrated on the fourth Thursday of November, and the following Friday is often a day off work for many people. November is the beginning of Los Angeles's rainy season, bringing an end to predictably sunny days. Rain doesn't peak until January, so it's sunny most of the days in November. And when it does rain, those gray days are typically followed by brilliant sunshine and clear, bright skies. If the weather tries to rain on your vacation, try these things to do on a rainy day in Los Angeles. November is one of the best months to surf in Southern California, according to Surfline. Long-sleeved shirts and layers work best. You'll be just fine in casual (but stylish-looking) attire almost anywhere you go, especially if you don a confident attitude to go with the outfit. A good street style will take you practically anywhere in Los Angeles. A mid-weight jacket will be enough on dry days. For rainy Los Angeles November days, bring an umbrella or a rain jacket with a hood. A hoodie may also come in handy for days when it cools off fast as the sun sets. Unless you're going to the ski slopes, you can leave the heavy winter coat at home. November isn't typically overrun with annual events, but these are few you might not want to miss. The Hollywood Christmas Parade is held the Sunday evening after Thanksgiving. You might expect an extravaganza on par with a scene from "The Ten Commandments," but in fact, it's a far more modest production (except for all the celebrities involved). Doo Dah Parade: Held in Pasadena, this quirky parody of the Rose Parade feels like a small-town main street parade. That is if that little procession morphed into a quirky, tongue-in-cheek extravaganza. Among the zaniness, you might see a flock of tiny Nash Rambler cars or the Men of Leisure Synchronized Nap Team—and always, people throwing tortillas. Crowds are light enough that you can find a place to stand just a few minutes before it starts. LA Auto Show: Hold onto your seat for one of the world's biggest auto shows. You'll see more than 1,000 new models, tuned and customized rides, and concept cars on display. You can even test drive almost 100 models. It starts in mid-November and usually runs through Thanksgiving weekend. AFI Fest: November's big film event in LA is sponsored by the American Film Institute. It showcases the best festival films of the year, and it's the only festival of its stature that offers free individual tickets to screenings and events as a gift to the community. Day of the Dead: On November 1 and 2 (or the weekend nearest those dates), you can join the city's Mexican and Mexican-American community as they celebrate the memory of their departed ancestors. You can find dozens of events in this Day of the Dead guide. Daylight Savings time ends in early November, which will push the clocks back and make it seem like the sun is setting later. Local attractions may change their hours. If you can, it's better to avoid LAX, which gets crazier and more hectic than usual around the Thanksgiving holiday. Instead, think about using the Burbank, Long Beach, or Orange County airports if you're flying in. Stay away from the theme parks and major attractions during Thanksgiving week if you can. That is unless you actually like to be in the middle of crowds that would make a school of sardines look skimpy. If you are looking forward to watching a television show filmed live, keep in mind that most of their crews (like everyone else) will be taking a holiday break during Thanksgiving.